It’s still cold here but the skies are blue, the days are getting longer and it seems like everyone is just a little happier – myself included. During the winter, I took a sanity break. * I’m pregnant. 24 weeks along. * Lauren is potty trained. Yay! I’m happy to have a break from diapers before our new addition makes his appearance. * I got super lazy with cooking and menu planning and didn’t do it. At all. I made a menu for this week this morning, hopefully dinners will go a little more smoothly this week. I suspect they will. I have no clue if I’ll be able to keep it up when the overtime kicks in and the Mister is gone for 90 hours a week. But for right now, when he’s only gone for 60, I’m going to give it my best shot. * Our little family still hasn’t been able to travel back to California to visit friends and family. We’re missing them so very much but are still waiting our visa extensions to come through. The FBI checks took the longest amount of time. 13 weeks. Finally, we got those back. Now it’s all in the hands of the New Zealand government. I hope they’ll be quick! Eh, that’s all I can think of. Here’s my menu for this week, I’ll post the recipe of our favorite dinner at the end of the week. Assuming I haven’t decided to become a hermit again. You’ll notice there is nothing listed for Sunday. I don’t do Sunday’s. I’ve declared it my day off from cooking. Want to share what you’re making this week? Head over to Org Junkie’s site and link up! Also, I’d love to know what you make for dinner when it’s just you or you and a little one. Please share with me in the comments. Thanks! After missing a week of menu planning I’m back to planning with a vengeance. I hated having to figure out what to make for dinner last week and I’m fairly confident my husband – who ended up having to cook twice because I told him he could have cookies for dinner – didn’t like it either. My menu took longer to put together this week. Since I am now in the Weight Watchers online program, I need cut back on putting whatever I want to eat on there. I actually have to think about it a little. Only a little. To be honest, the only thing I didn’t put on the menu that I was craving was homemade cheeseburger macaroni. And that was only because I was rushing and wanted to figure out the PointPlus value on it first. Don’t be surprised if you see it listed next week! Interested in starting your own MPM post? Click here for info. Last week my husband said if I made the grocery list he’d do the shopping. This was an especially good deal for me because my list was already done and was categorized by department and was in order by where the stuff was in the store. So off he went. He came home 2.5 hours later, missing 3 things and was $150 over budget. WTF? I decided to stretch the one week menu plan into two. Leftovers became second dinners instead of lunches. Side dishes were pulled from mains and paired to make a full dinner all by themselves. It worked quite well. I can seriously thank my lucky stars I had plenty of lettuce in the crisper for salads to whip up and that my experimental soup ended up making enough for two dinners. I also ended up making the easiest, tastiest biscuits! I needed something the second day of soup and didn’t have all of the ingredients to make the usual buttermilk variety. So I turned to the internet and found a recipe that was so different I HAD to try it. I didn’t think they’d be good enough to post and I didn’t take a picture so I need to make them again this week. I swear, I’ll post it later this week. The highlights from last week were broccoli salad, the biscuits and the minestrone soup. Here’s the soup recipe. It was SO good and very, very filling. Plus, it was on the table in just over an hour. It was the perfect dinner for the stormy, wet days we were having last week. I analyzed the receipt and (sort of) figured out what the heck happened. I’m glad that I was able to figure out a way to make it work so we didn’t blow up the budget this month. We did go over a little because I made tacos last Saturday but beef mince (ground beef) was on sale for a really good price and I had everything else in the pantry. And dang it, I *REALLY* wanted them. Thu – Lemon chicken, brown rice, probably more peas. Hubs bought a 2KG bag of frozen peas. Last week went pretty well. I did have a meltdown resulting in a mini-strike on Friday that had us ordering in pizza though. I blame lack of sleep. But it was laziness coupled with lack of sleep that is really to blame. I would be hard-pressed to pick my favorite meal of the week. Honestly, they all turned out well. I am so loving that I am trying new recipes now. Before, I would collect recipes from all over and SAY I’d try them someday. But I rarely did. Now, if I see a recipe I want to try, I add it to the next open spot on my weekly menus and it’s done. As an added plus, I have menus loosly planned about 3 weeks in advance now. All I need to do is switch some days around so we’re not having the same protein two days in a row. I’ve made some real winners recently and I look forward to posting them here to share. Last week went so well! I had no idea how much I was going to enjoy having the menu plan. There were two nights last week I was really tired and just didn’t want to cook. But I did because a) I knew what I’d be making b) I knew we had all the ingredients for it and c) the stuff would rot in the fridge if I didn’t make it. Overall, I declare week one to be a success. We didn’t have to make any additional trips to the market. I cooked at home every single day. A couple of the meals were winners and they’ll be put into our monthly rotation. I did have one side dish that was a colossal failure. Bleh. At least it wasn’t the main. I’ll post the recipes that work out here. I want to have them in a place where I can keep track of them. Yeah, there is a lot of meat. J is a meat-eater and if I don’t serve meat at dinner, he will eat through my pantry like a goat. For quite awhile now, I have wanted to be organized enough to start planning the menu in our house. I hate trying to figure out what we’re going to have for dinner each afternoon. It seems that 4 times out of 7, I don’t have the ingredients on hand to make what I decide I want and then a trip to the store is in order. This creates 4 opportunities to buy crap that we just do not need along with the 1 or 2 things we do. Last week when I catching up on my reader I followed a couple links and ended up landing at orgjunkie.com, where I found the Menu Plan Monday (MPM) link up. 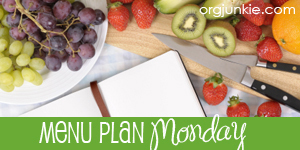 Since the New Year has begun, I’ve decided that creating a menu plan each week is a great goal for me. It gives me a way to budget, ensure healthful eating, and it will decrease the dreaded impulse buying we’ve become so bad at. It may even lead to less waste. I HATE throwing food away. It feels like I’m just stuffing dollars right in the rubbish bin. That needs to stop. I’m excited to begin this and have high hopes that I won’t abandon it mid-month. Also, I’ll likely post the yummiest recipes here so I won’t forget about them, as I tend to do now. Just for the record, I’m not looking forward to the cashew rice. I’m not a fan of nuts in savory foods. But J loves them. So I’m doing it for him.